Do you read Internet forums? If so, then you need Web Forum Reader. 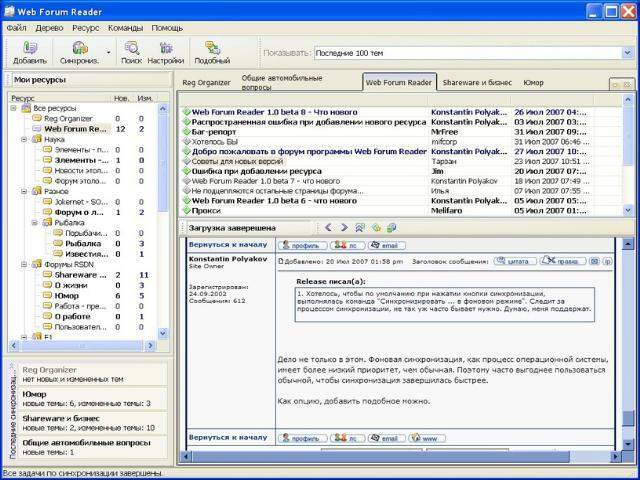 Web Forum Reader is uniquely designed for reading Internet forums and conferences. You can easily add your favorite forums to Web Forum Reader to stay informed about updates and changes on these forums without loading them in your browser. Web Forum Reader saves you time by showing new and updated topics while hiding topics you have already read. Web Forum Reader will also reduce the amount of data you download compared to regular reading using a browser. Use Web Forum Reader's handy Resource Addition Wizard to add Internet forums and conferences. * Convenience: Mark new topics, recently updated topics, and topics that you have already read. * Flexibility: Add various types of forums and Internet conferences. * Precision: The built-in browser automatically scrolls the page to the position where new posts were added to the topic. * Scheduling: The Scheduler feature will always keep you informed about changes in the forums you are interested in. Web Forum Reader will notify you about new and updated topics in forums as soon as they appear. * Favorites: Mark your most interesting forum topics as your favorites. Be alerted to new posts in these topics first. * Organization: See new and updated topics on all forums at once in one list. * Efficiency: Reduce data downloads and save on bandwidth costs. * Time savings: Show only new and updated topics while monitoring multiple forums. * Ease of use: Join several similar forums into groups. Synchronize grouped forums with a single click. * Multitasking: Use tabs to work with several forums simultaneously. Music MP3 Downloader allows you to search and download 100 million MP3 from the largest music network. It is 100% clean and safe. It recommends you the USA Airplay Hot 100 of each week and lists the hottest songs of 14 categories for you to choose. MP3 Free Downloader is a Free application that lets you browse and download millions of mp3 to your PC or digital players safely and easily. Additional features include unlimited listening on line, Top Hits recommendation, catalog genres, and more. Instant access to 100,000,000+ high quality songs with no limitation. All songs are in the MP3 format and can be played on any computer or on any MP3 Player including iPod. Recommend the Top Hits. User-friendly interface. NO risk of any malware. MP3 Rocket Download, the best free mp3 download software, allows you to listen to music online with no limit, fast search and download 100 million virus-free songs for free, enjoy upto 320kps bitrate mp3 and more. It supports all portable devices. Hot MP3 Downloader gets you instant access to 100 million songs by 14 styles for FREE, all in high quality. It also recommends you hit songs every week. It is simple to download and install, and free of any malware. Super MP3 Download allows you to download 100 million MP3 for free and listen to the songs online before downloading. It is 100% safe and clean. It recommends you the USA Airplay Hot 100 of each week and lists the hottest songs of 14 categories. A small application to make quick and easy work of downloading and converting videos from YouTube. After downloading videos it will auto convert FLV files to MP4, 3GP, AVI, WMV, MOV etc. Soon, you can see youtube videos on your MP4 or mobile phone! YouTube Telecharger is an all-in-one freeware application that lets users download high quality videos from YouTube. YouTube MP3 Downloader is a windows application to download YouTube MP3 songs and music videos. YouTube MP3 Downloader supports HD/HQ YouTube Video downloading, and also supports most of popular media formats like MP3, MP4, WMA, WMV, WAV, AVI etc.